This giveaway is now CLOSED. Thanks so much to our wonderful sponsor California Wine Club! We look forward to working with you again! The winner has been notified and upon confirmation, follower name will be posted both here and on our homepage. Remember: There are great giveaways active on the upper right hand side of the page! Dads N Grads Month has been a whirlwind this time around and seems to be moving along so quickly! Today is the first day of summer, the summer equinox, the longest day of sun of the year! A perfect day to be outdoors enjoying the sunlight and a perfect day to chill a nice bottle of wine! Are you celebrating an adult Grad, either College, Grad School, Med School or Law School and looking for a unique way to say 'Congratulations' and wish them well on their road ahead? Not that the California Wine Club is exclusive to Dads or Grads, it's a great anytime gift for the wine connoisseur, wine novice, or someone like me who is somewhere in between the two! Ƹ̵̡Ӝ̵̨̄Ʒ - Membership costs nothing, you can cancel anytime, and every wine is 100% guaranteed. - Like a good mobile carrier, there is nothing better than no contracts and no commitments! I tried: I had the chance to try out the 2007 Bixler Union Island Red Table Wine which is a blend of Merlot, Syrah and Petite. This versatile wine shows very rich, ripe, forward fruit, with flavors of ripe plums, cherries, blackberries and a hint of toasty oak. Food Pairing Suggestions: Crafted to be both approachable and versatile, pairing nicely with most any grilled red meat, sausages, stews, hearty soups, pizza, pasta and hamburgers. Being nicely balanced and silky smooth, this wine also works well as a cocktail - by the fireplace, at picnics or at your next party! I tried: I had the chance to try out the 2008 Bixler Vineyards Union Island White Table Wine shows of citrus, with rich, ripe fruit and flavors of grapefruit and a hint of banana. No oak was used during aging, allowing the ripe fruit to be fully expressed in the finished wine. I have a very weird palate and in terms of preference it's (extra dry) Champagne first, then White Wine with Reds coming in third. I have a taste for dry champagne and my favorite is actually one that is not the most expensive, but I find it the superior choice for MY palate. When I collaborated with California Wine Club they took the time to get a sense of my tastes and what I like and don't like flavor wise. 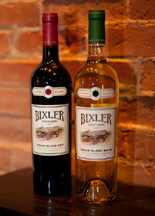 And when the Bixler wines arrived at my door, I approached them with a sense of adventure, I had no idea what I was in for. I will admit I went straight for my comfort zone and tried out the white first. It almost didn't make it as a pairing with the meal I was making, it was THAT good. I like to make Beurre Blanc sauce with my fish, and so I opened it to use in my sauce, before cooking with it, I knew I should taste it and make sure I was happy with the flavor, I was literally blown away when I took my first sip and found that it tasted exactly like my favorite brut cava extra dry champagne! It tasted just like it without the bubbles. I had to remind myself that some was going into my beurre blanc and the rest was supposed to be for dinner! I'll share my personal pics of it with the meal I prepared very soon. It is recommended to use this wine within a year of shipment, and I see why, it's bursting with flavor, and I'd be surprised if anyone could let this just sit for even a year nevertheless going past the year mark! I'm not going to say that I'll ever reach Sommelier level of expertise, but I really do enjoy Bixler Wines and very highly recommend them, and very highly recommend California Wine Club, their personalized service made this at home 'tasting' an absolute pleasant surprise and a total pleasure. Ƹ̵̡Ӝ̵̨̄Ʒ - WIN IT! - Ascending Butterfly and our new friends at California Wine Club have a very special surprise for 1 lucky winner! 1 winner will get to try out the California Wine Club and experience at home delivery of one red wine and one white wine. (Winner will receive the vineyard being featured at the time of the win, they may or may not receive the same wines I tried). Don't you just ♥ California Wine Club? I know I do! Ƹ̵̡Ӝ̵̨̄Ʒ - How to Win: (1) You must be a PUBLIC follower of Ascending Butterfly to be eligible for this and all giveaways. Indicate in your entry that you follow (if your 'comment name/user id' differs from your profile id, please let me know what name you follow under) and (2)MANDATORY entry- (A) You must preface your entry by stating 'I am 21 years of age' (B) Visit the Member Benefits Page and share one thing you learned about California Wine Club Serivce and Member Benefits here. (3) You must also leave your email address somewhere in your comment. (You can format it this way for security, example: ascendingbutterfly AT mail host DOT com). (If your email is clearly visible in your profile, you can just say so, that's OK!) Please follow the easy 1, 2, 3 steps to winning (or in this case, the A,B,C’s of winning!) This giveaway is open to USA residents who are 21 years of age or older. No PO Boxes. One entry per Household, see Ascending Butterfly Giveaway Rules and Disclosure Policy HERE. Ƹ̵̡Ӝ̵̨̄Ʒ - In the spirit of Father's Day Fun share with us your favorite advice that your dad has given you! (and yes, if you were not raised by your dad, you can share with us the best wisdom received by the person who did raise you! Uncles and Grandpas count too!) Or you can share if you are giving these to lucky guy in your life or keeping them for yourself! And since this is also Grads month, you can also share the best advice you've given a grad too! Follow you publicly on GFC as Elena; I am 21 years of age (so nice of you to ask!) and my favorite Member Benefit is as follows: No more guessing, no hassle and no more bad wine. Works for me! I am keeping this wine for myself. I know Martha Stewart advocates freezing leftover wine to be used later in sauces and gravies. To which I say - what leftover wine???! I visited the Member Benefits Page and learned that Three and four bottle shipments are available, and California Wine Club Service will pay the extra cost of shipping! i learned they have Wine Country Travel Experts to help you plan a getaway! I follow on GFC (elysesw) am WAY OVER 21 and learned they feature handcrafted award-winning wines from real working, artisan wineries. I am 21 years of age. Public follower as john dot carroz at g mail. I think discovering smaller, award-winning wineries whose wines are not typically found in our Washington state stores or wine shops would be nice. I'm a gfc friend and I am (well) over 21 years old. I like that they even have wine country travel consultants available! I learned that three and four bottle shipments are available, and they'll pay the extra cost of shipping. voted for your red jacket! dad told me to never hang out with Mafia (like I would to being with!!!) - he'd say Run The Other Direction!! in his thick Hungarian accent! I am a PUBLIC follower of Ascending Butterfly and I learned that the CA Wine Club offers expert advice on wine and travel! I am 21 years of age. I learned that wines can be delivered monthly, every other month or even quarterly. My email is asthenight at gmail dot com, and I follow your blog with Google Friend Connect. I am 21 years of age.I follow you on GFC.A benefit of joining is they have experienced wine consultants to assist you with your wine choices and questions. I follow Tracy_Iglesias on Twitter as ptowngirl. I am 21 years of age. I follow via GFC and I learned "•Savings of up to 50% off normal retail when you reorder your favorites" Nice! my best graduate advice (if you're going to college) is "go at your own pace. a four year college experience isn't as normal anymore. it can be five." I am 21 years of age, actually 24! I follow via gfc (andrew dankleff) and I learned that they have consultants to assist you with your choices! Hi, I'm over 21 years of age. I like that they don't send bulk, closeout or private label wines. I'd give these to my hubby, who might share with me! I follow @cawineclub on Twitter (@shala_darkstone). I learned that California Wine Clubs has "convenient, 'to your door' delivery." Learned - •Savings of up to 50% off normal retail when you reorder your favorites. Follower, 'I am 21 years of age' I learned that both three and four bottle shipments are available, and California Wine Club Service will pay the extra cost of shipping, thanks! I am 21 years of age and following via gfc---I like that you get a Savings of up to 50% off normal retail when you reorder your favorites. I learned that your wines can be delivered monthly, every other month or even quarterly. That's nice in a member club.. I am 21 years of age, follow via gfc (happi shopr) and learned that you get Savings of up to 50% off normal retail when you reorder your favorites. I learned that a member benefit is savings of up to 50% off normal retail when you reorder your favorites and your wines can be delivered monthly, every other month or even quarterly. Best advice I gave to my neice graduating is don't get caught up in partying and make sure to keep her grades up. I am more than 21; there are four wine club options. I am 21 years of age. I'm a GFC follower (as Erica Carnes). The best benefit is getting to discover smaller wineries. 1. I follow you publicly via GFC (Cataroo)! 2. 'I am 21 years of age' (more than 2x over!! 3. I learned that Three and four bottle shipments are available, and they'll pay the extra cost of shipping! WOOO HOOO! I already rocked the vote for you! If I am lucky enough to win, I am keeping these all to myself as a 50th birthday present! I already follow @Tracy_Iglesias on Twitter (@Kitty32504)! I follow @cawineclub on Twitter (@Kitty32504)! I follow @Ascending1 on Twitter (@Kitty32504)! I already "like" Ascending Butterfly on Facebook (Dara Nix)! I already joined Ascending Butterfly's NEW Community/Real Time Chat Group (Dara Nix)! "You successfully fueled the following blog: http://ascendingbutterfly.blogspot.com."! I am 21 yrs of age. I learned that being a member of the club you have experienced wine consultants to assist you with your wine choices and questions. I learned that you can order three and four bottle boxes and pay no extra for shipping. I Voted for you on "Your Best Pose" I am #173 (I think) in the vote counting. "I'm not sure if I can share my father's best advice to since, which applied whenever you were confronted or confounded by obstacles (especially the kinds that came/come in "human form" - it was simply / along the lines of "F*** 'Em"
I am 21 years of age and I learned they have wines from small vineyards that may not be found in the local stores! i voted for you! :)good luck! I think the best advice I've given a high school grad is, "You don't have to go to college the day after you graduate high school. Get some experience under your belt. Travel. Meet people. Try new foods! Explore!" I was forced into college immediately after high school graduation and wasnt mature enough to take it all in yet. I traveled the world, went back to college at 30 and earned 2 bachelor's degrees in 4 years. It's all about timing. Life is a journey and we should each take it in our own way. GFC follower as jcottey. I am over 21 years of age. I learned that you can have wine delivered monthly, every other month or even quarterly. I voted for you on Your Best Pose. Since my father has passed away, I would probably give these wines to my mom. She drinks wine more than me. i visited the member page and i learned that Three and four bottle shipments are available, and we'll pay the extra cost of shipping. I'm a PUBLIC follower of Ascending Butterfly. I am 21 years of age. I learned that they have savings of up to 50% off normal retail when you reorder your favorites.